We took the dinghy out for a tour of Cape Town Harbour and found an unusually diverse collection of ships moored there, including a super-yacht, a cruiseship, an icebreaker, a diamond-miner, and a small boat with 1,200HP of outboard engines; several drillships, offshore supply vessels and cargo ships; and many fishing vessels. 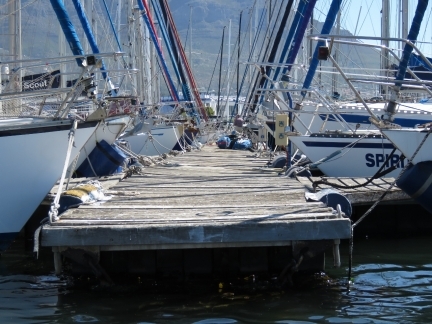 The outer harbour also is home to the Sturrock Dry Dock and the Royal Cape Yacht Club. South African boat builders Roberston and Caine builds catamarans under the Moorings, Leopard and Sunsail brands. Over the time we’ve been here, the docks around us have slowly been filling up with brand new, mostly with Mooring’s branded catamarans. 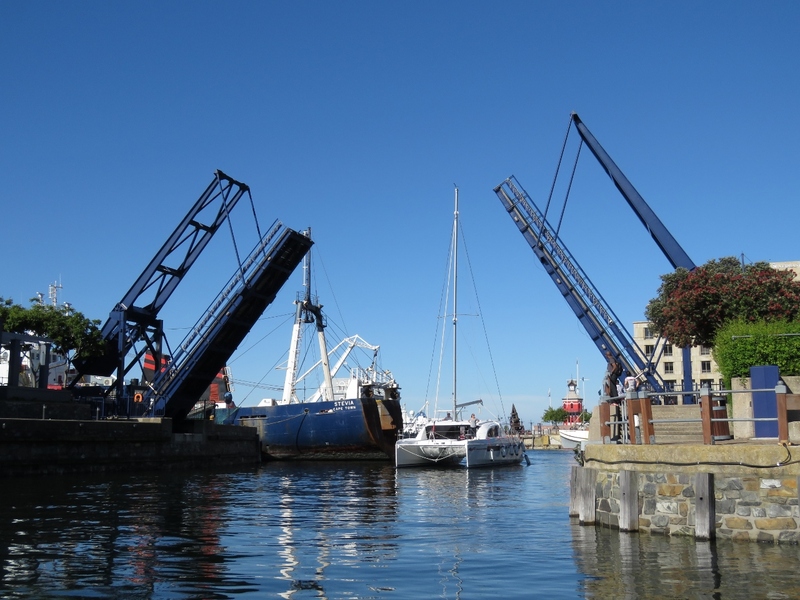 Apparently this happens every month as the boats are produced and launched. 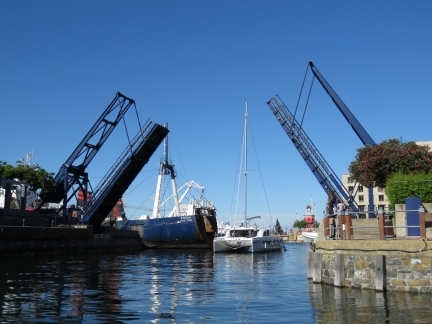 The docks then drain quickly as the boats are moved onto a bulker for transit. We set off on a dinghy tour of the harbour as another Moorings boat was arriving into the marina. 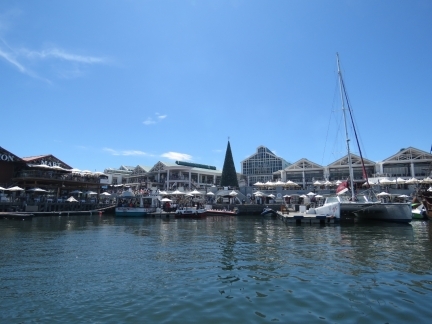 The V&A Waterfront is packed with people on this sunny Saturday afternoon. This massive Krupp crane moored in the waterfront has a 200-ton lifting capacity. 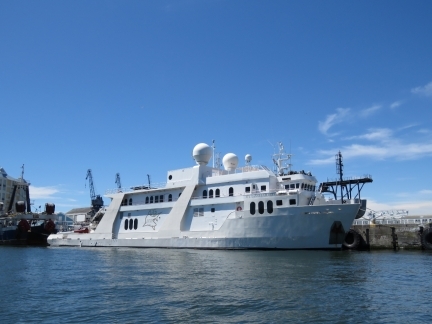 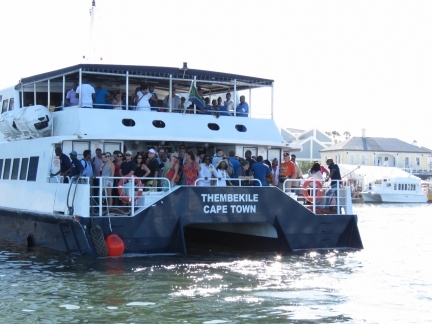 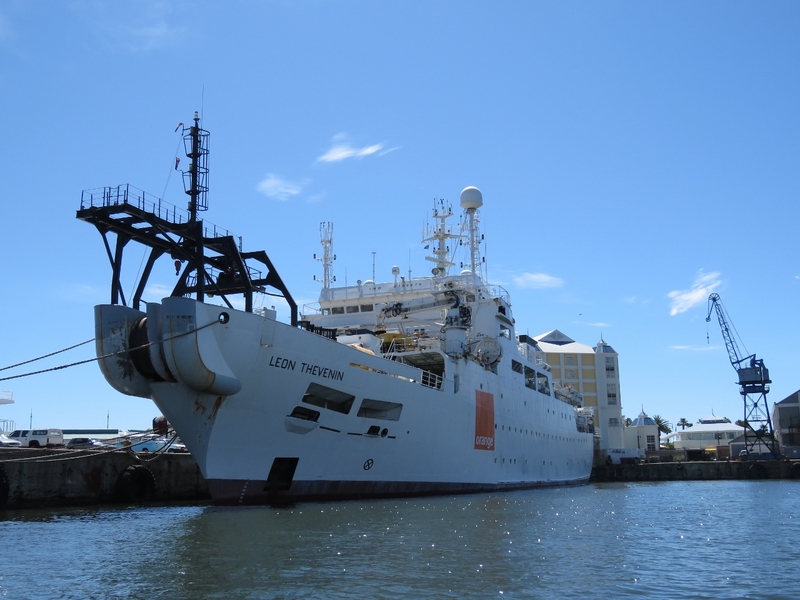 An unusually diverse collection of ships are at Cape Town, and some are just unusual. The Danah Explorer operated as an offshore supply vessel in the Gulf of Mexico for 30 years, then became a fishing vessel and later a research vessel. Last year Southern African Shipyards of Durban, South Africa transformed the ship into a luxury yacht whose working roots still are clearly visible. The French cable-laying vessel Leon Thevenin is famous for recovering the flight and cockpit data recorders from Air India Flight 182 that was bombed over Irish airspace in 1985. 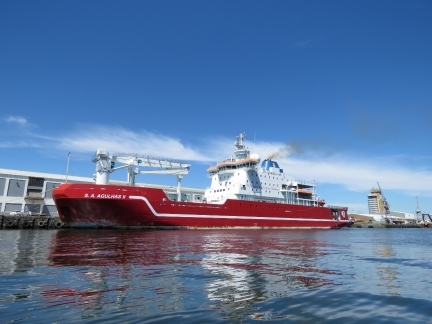 The S.A. Agulhas II is a South African ice-breaking and polar supply ship built in 2012. About eight helicopters were staged just outside the harbor for aerial tours. 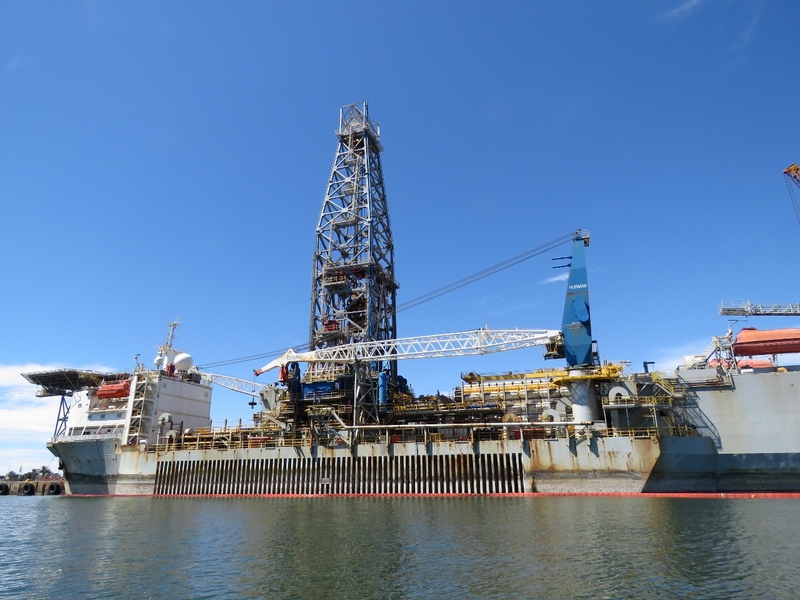 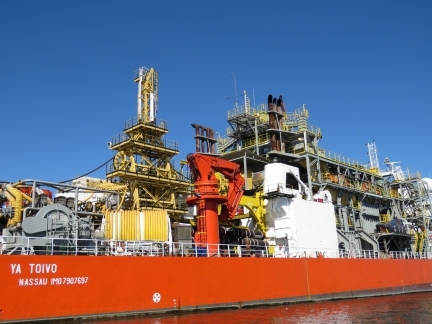 The Paragan DPDS2 drillship can in water up to 5,600 feet deep and drill down to 25,000 ft.
Oceania Cruises’ 782-ft Marina, launched in 2011, was in port for the start of a 24-day cruise from Cape Town to Buenos Aires. The tug Merlot assisting the bulker Lavela out of the harbour. The 2,632 gross tonne mining ship SA Explorer. 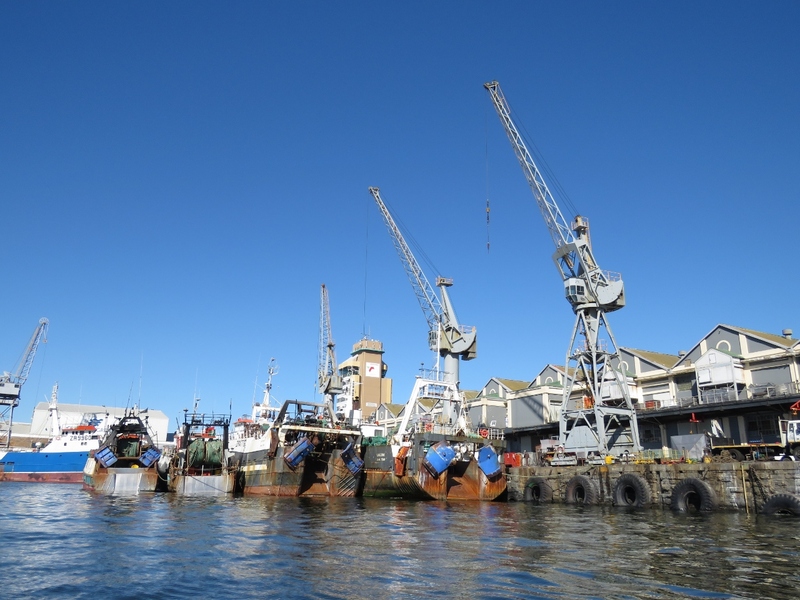 Robinson dry dock at the V&A waterfront is the smaller of two dry docks in Cape Town. 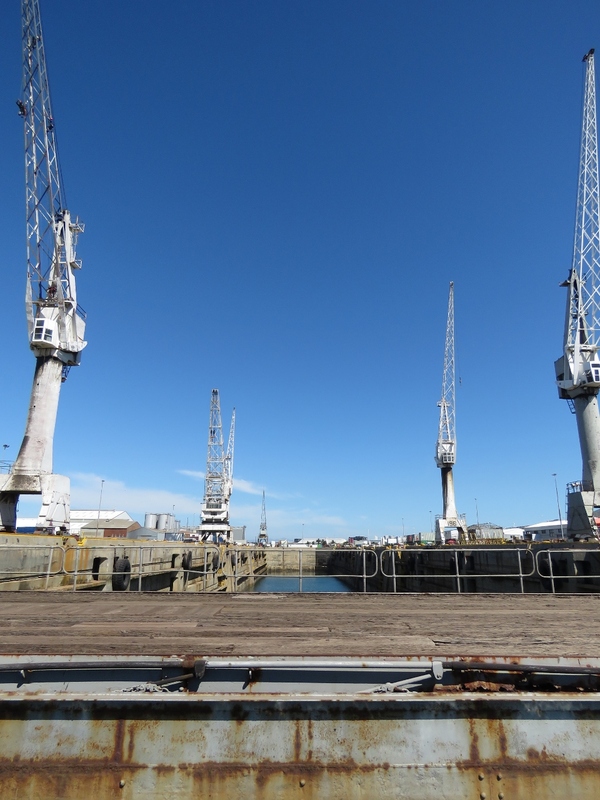 This is one of the two door for the larger one, Sturrock Dry dock, that can be divided into two separate compartments. 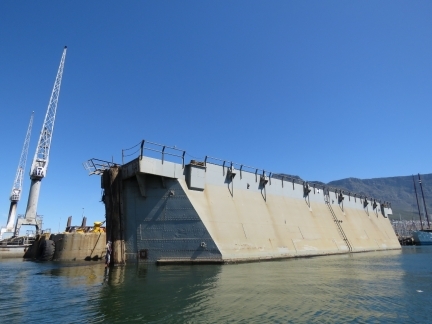 The Sturrock Dry Dock was designed for battleships and aircraft carriers and can handle ships up to 359m long and 45m wide. 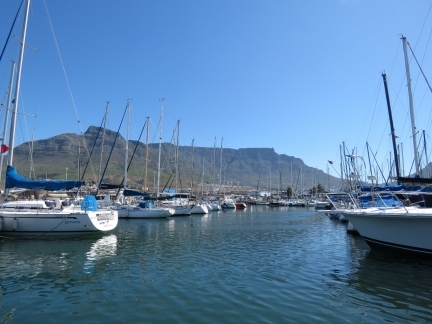 The Royal Cape Yacht Club is the other pleasure craft marina at Cape Town and like the V&A Waterfront Marina has Table Mountain as a beautiful backdrop. 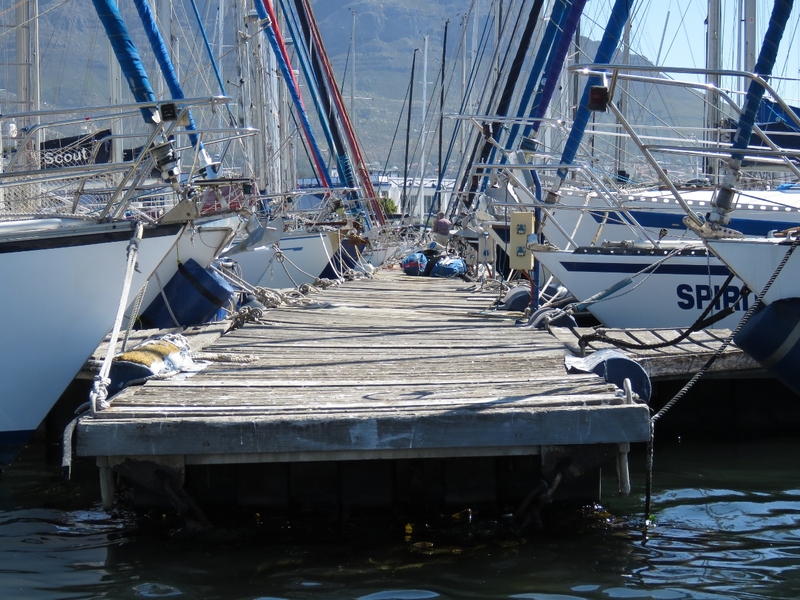 The setting at RCYC is beautiful, but docks don’t look strong enough to hold Dirona. 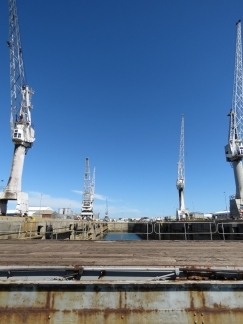 We’re glad to be at V&A. Cape Diving‘s Beast has 4 300-HP Sizuki outboards. 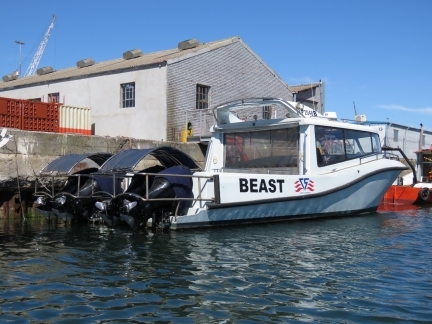 1,200 HP of outboards is the most we’ve ever seen. 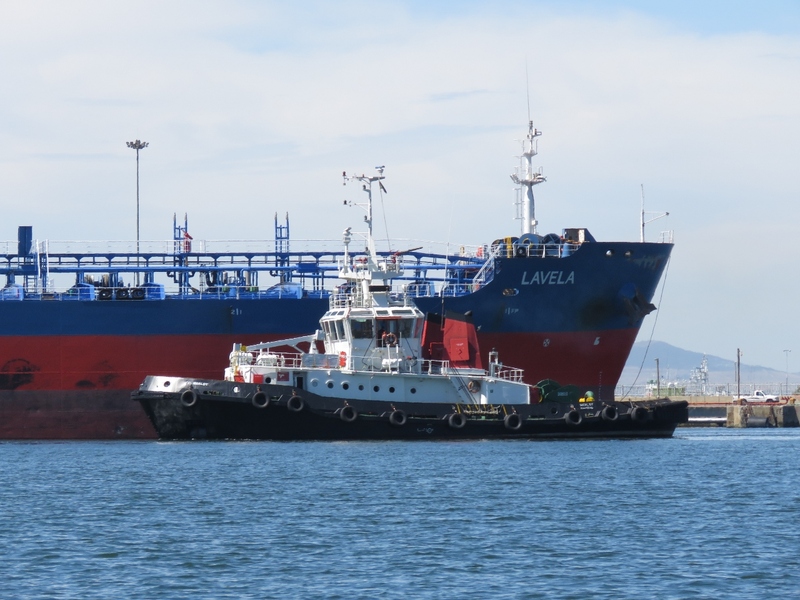 The previous record was 3 by 350-HP in a law-enforcement boat being tested in the Puget Sound near Seattle. 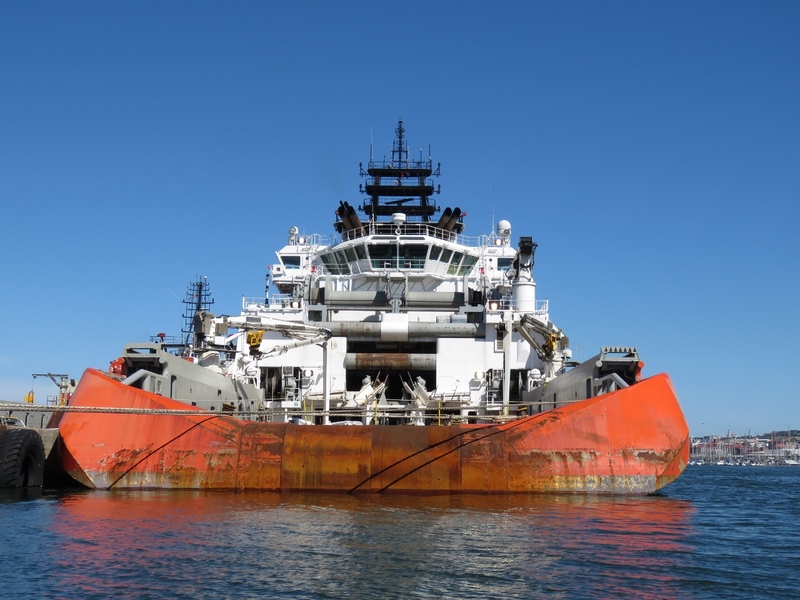 The 92m offshore supply vessel Pacific Dolphin has a bollard pull of 220-240 tonnes and 500-tonnne winch line pull. 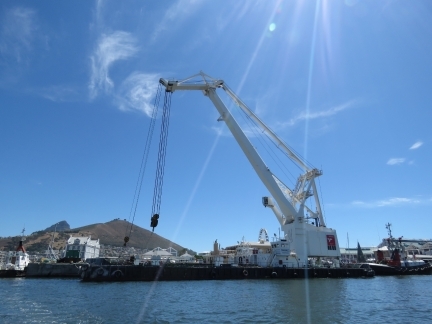 The mining vessel YA Toivo has two massive anchors at each end to secure it for mining operations. The British Navy previously owned the ship as the HMS Challenger and used it for deep sea operations and saturation diving. 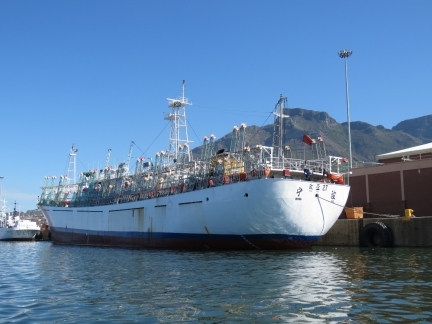 Namibian Minerals Corp later purchased the ship and named it after Namibian anti-apartheid activist Andimba Toivo ya Toivo, who also was imprisoned on Robben Island. 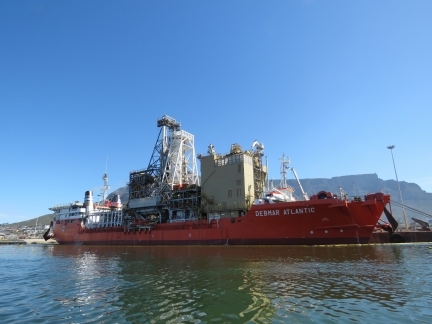 The Debmar Atlantic is a diamond-mining ship owned and operated by Debmarine Namibia, a joint partership of De Beers and the Namibian Government. Several foreign fishing vessels like this were throughout the harbour. 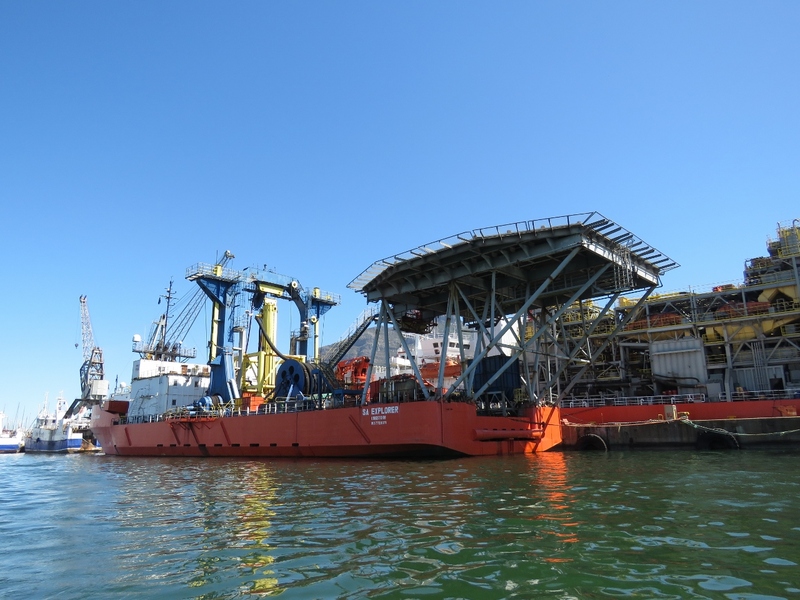 The decks were ringed with bright lights and small platforms with spools on the end that could be lowered out over the water. 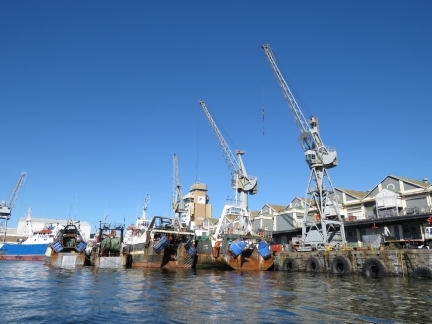 South African fishing vessels rafted in Victoria Basin. 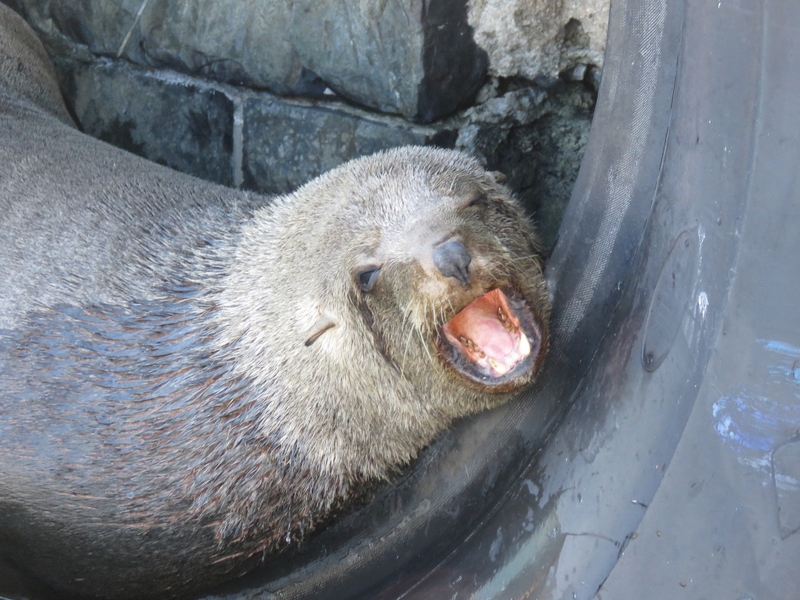 This African Fur Seal was curled up in a tire hung from the wharf. 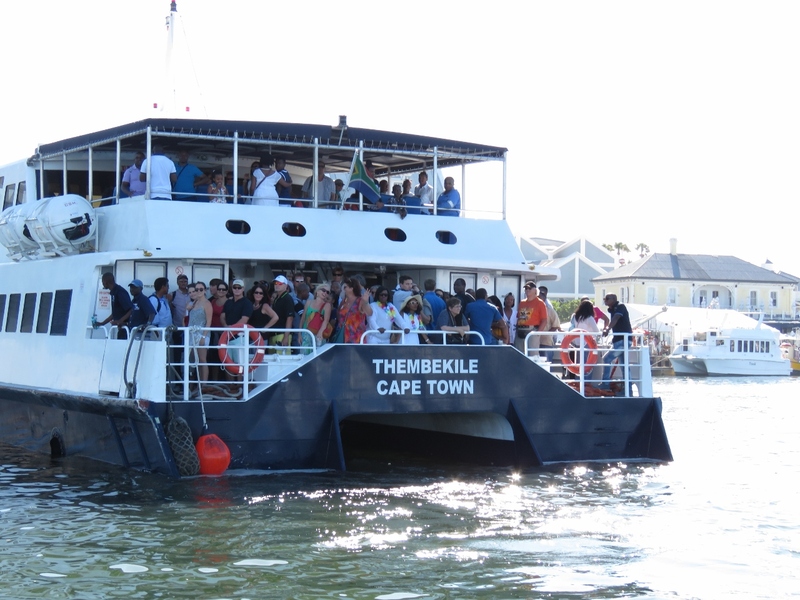 Thembekile returning from Robben Island with a full load. 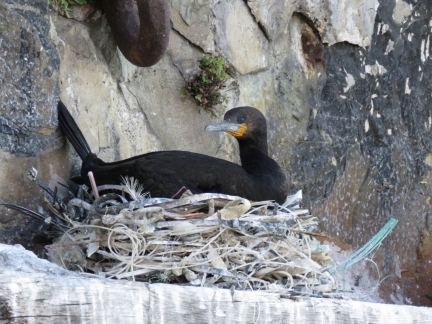 Cape Cormorants, with their distinctive orange neck patch, were nesting along the wall by the swing bridge. 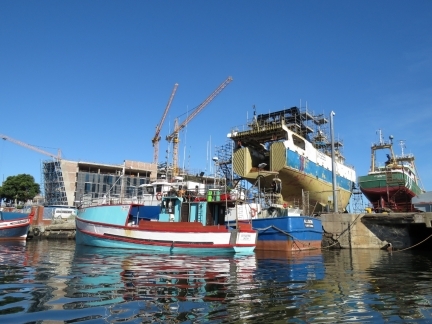 Fishing vessels moored off the synchrolift. 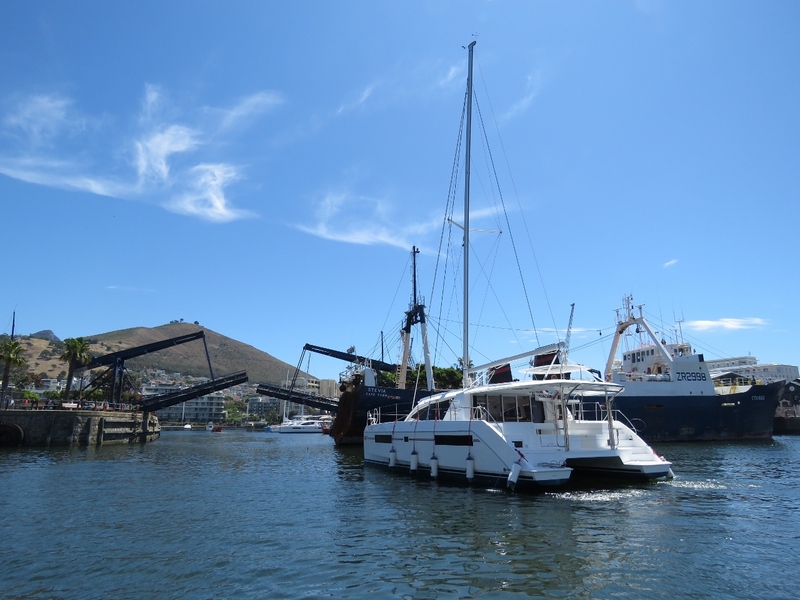 Another Moorings catamaran was arriving as we returned. The V&A waterfront is hard to beat and Cape Town in general is one beautiful picture after another. 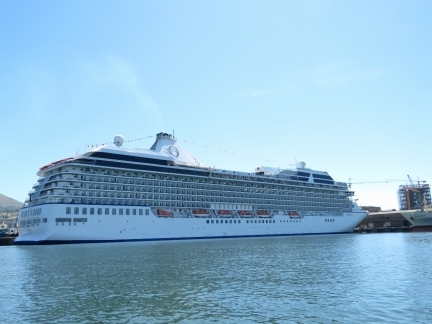 It’ll be hard to leave. 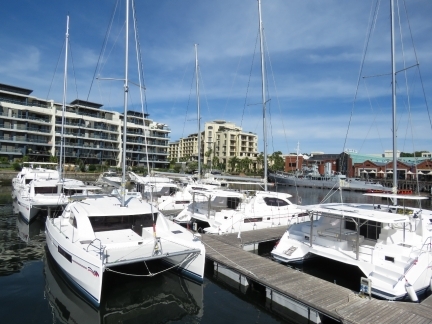 Our new company calendars just came out and the March photograph was taken at the V & A Waterfront. 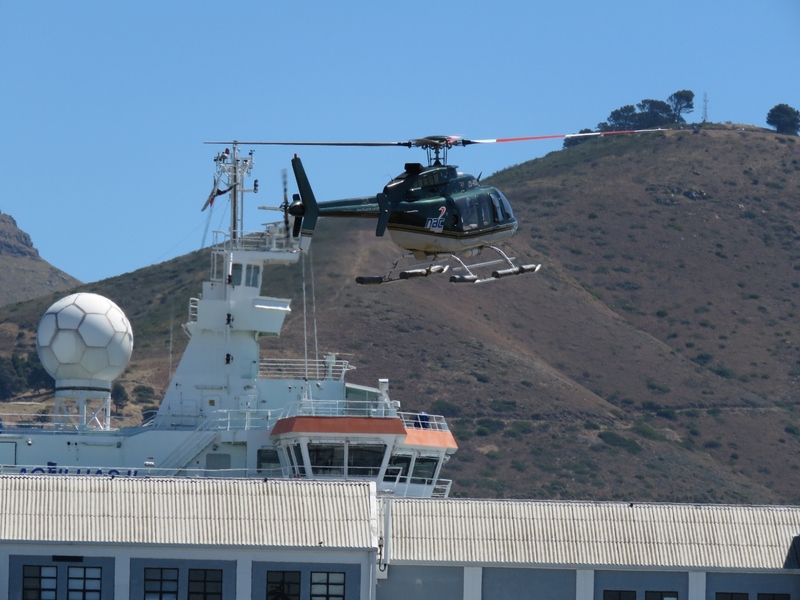 Recognized it from your pictures. 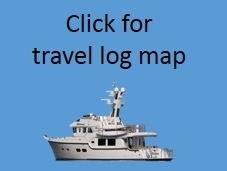 Again, thanks for all the work you do to share your adventure with us.